Thanks to years of research, we know that City Connects’ model of providing integrated student support helps improve students’ attendance, grades, and test scores. And thanks to recent research we know that City Connects yields an impressive return on investment (ROI). As we’ve blogged, Henry Levin and A. Brooks Bowden, of the Columbia University Center for Benefit-Cost Studies in Education, did a benefit-cost analysis of City Connects, and found strikingly positive results. For every $1 invested in City Connects there’s a $3 ROI. This calculation includes the cost of City Connects and the cost of the services – such as food, clothing, health care, and afterschool programs – that children and families receive. Released in 2015, this study, also found that comparing the cost of City Connects alone to the benefits it generates yields an $11 return on every $1 invested. In 2018, Levin and his colleagues conducted a follow-up study that compared what traditional schools spend on student support to the costs and benefits of City Connects. It does cost more to implement City Connects. Schools have to use district funds and/or philanthropic dollars to pay for this cost. But for every dollar spent on this modest, additional cost, the return on investment is $24. In addition, the study notes that the City Connects model streamlines the process of providing student support because it has “three fundamental features,” that boost organization and efficiency: “a designated and well-trained individual,” the coordinator; a “Web-based database” that tracks services and collects data that can be evaluated; and a network of community partners who provide services. 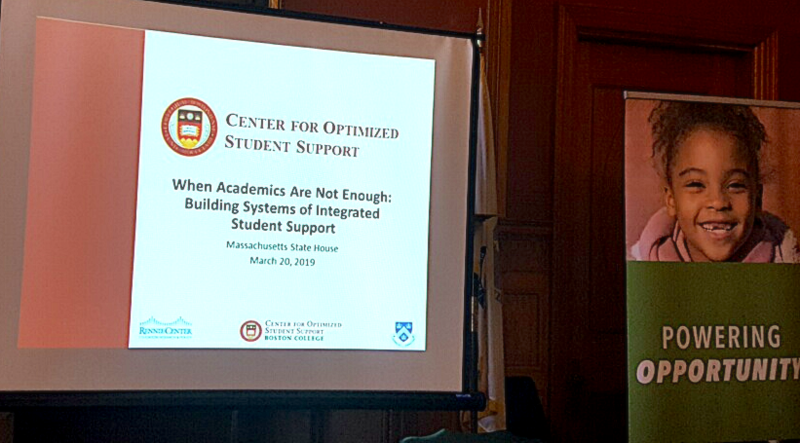 These return on investment findings were shared last week at the Massachusetts State House by members of the Center for Optimized Student Support, where City Connects is based. We were hosted by Representative Alice Peisch (D-Wellesley), Senator Jason Lewis (D-Winchester), and Senator Sal DiDomenico (D-Everett), and we shared the benefits of effective, integrated student support practices with more than 25 legislative staffers and elected officials. We’ve also put the return on investment findings in a research brief that’s posted here, because it’s crucial to point out that making a wise investment in students’ needs produces an educational and a financial return for society.